Playing behind a top NHL prospect, not much was expected of Peter Delmas. But the Lewiston goalie has made the most of his playing time and has turned himself into a top prospect for the 2008 Entry Draft. It's not easy making a name for yourself when you're the backup goalie behind a first-round NHL draft pick, but Peter Delmas did it. The prospects weren't bright for Delmas two years ago at the training camp for the Lewiston MAINEiacs of the Quebec Major Junior Hockey League. A few months earlier, starting goalie Jonathan Bernier was taken by the Los Angeles Kings with the 11th overall pick in the 2006 NHL Entry Draft. Delmas had been just a fifth-round pick in the QMJHL draft, an unheralded goalie out of Nova Scotia. Can you name a famous Nova Scotia-raised goalie? Points if you said Eldon "Pokey" Reddick -- there haven't been many. So expectations weren't high for Delmas, but the tall, skinny netminder won the backup job with hard work and sharp play. Bernier was expected to play the vast majority of games on a team with league championship potential. And he did -- until he got hurt in January. Delmas stepped in and went 23-10 -- and the MAINEiacs went on to a 50-14-2-4 record. They won the league title and played in the Memorial Cup. Delmas was selected to the QMJHL All-Rookie team and was the rookie of the month in March. Bernier was the starter again in 2007-08, but the Kings had him start the season in Los Angeles before returning him to Lewiston. 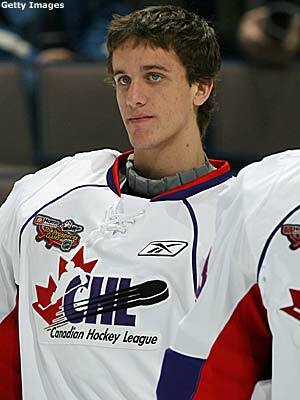 Bernier then played for Canada in the World Juniors. "I was only guaranteed 15-20 games in my rookie year but I played 34, partly because Jonathan was injured for 20 games," Delmas said "I went 15-5 while he was out and I played pretty solid. I just showed the team I belonged. "This year, the plan was to split the games evenly, but Bernier started in Los Angeles and I played 10 games in a row. Then he went to the World Juniors and I played the whole month of December. After that, I played every third game." Delmas and Bernier had fairly similar numbers. Bernier was 18-15 with a 2.73 goals-against average and a .908 save percentage, while Delmas was 17-17 with a 2.84 GAA and .903 save percentage. Both were among the league leaders in goals-against average and save percentage despite playing for a team around .500. Delmas was selected to play in the Canadian Hockey League Top Prospects Game and was named scholastic athlete of the month for February. "We had an OK season," Delmas said. "I wanted to go deeper in the playoffs, but it was sort of a rebuilding year. We had a pretty young team." Delmas seems fueled by several incentives. He's following in his father's footsteps and he wants to increase the number of NHL players from Nova Scotia. There were only nine players from the Maritime province in the NHL last year; Sidney Crosby was the most notable, but Glen Murray, James Sheppard, Colin White and Eric Boulton also are Nova Scotians. "Coming out of Halifax, nothing was expected of me because there are not a lot of good players," Delmas said. "Just the occasional Sidney Crosby. That's my inspiration, being a Nova Scotian and making the NHL. "I also wanted to do better than my dad. He wished he could have gone further, and he is very proud to watch me go as far as I have. He grew up in Montreal and got as far as Midget AAA. He was my inspiration to become a goalie, but he didn't push me and it was just something that I wanted to do. "I was seven years old when I started with the Leafs Bedford Timbits, and I played most of my youth hockey with the Bedford Blues. I played with the Halifax Macdonalds' Midget AAAs and got drafted by Lewiston." Delmas' goaltending hero is playing at the opposite end of the continent, but is a product of the QMJHL. "Roberto Luongo is my hero," Delmas said. "I kind of model my style after him. The way he plays, he has a similar low crouch stance and he's very fast, side-to-side, like me. He's calm off the ice like me also. He's a very good role model." At 6-foot-2 and 169 pounds, Delmas is tall and lean. He's likely to get heavier -- but like Luongo, he doesn't look like he'll ever get heavy. Patrick Roy wasn't heavy, either. Delmas is lightning quick with his hands and feet, and very adept at handling the puck. Lewiston coach Ed Harding involves his goalies in puckhandling and moving the puck up ice. "Peter is an athletic goaltender with quick reflexes, strong puck skills, and is an outstanding teammate," Harding said. NHL Central Scouting goaltending consultant Al Jensen likes what he's seen. "Peter is a different style of goalie, more laid back than usual," Jensen said. "He doesn't get too excited, but he plays big, even when he goes into his butterfly. He's technically very sound and always square, and doesn't give up many rebounds. Peter plays very well under pressure, and I thought played very well during the three days in the Top Prospects game, as well. That's why he's so high, No. 3 (among North American goalies). He has good size and athletic ability. He's patient and strong and he's able to close the door in the third periods, which I was impressed with over the course of the year."